Most of all, I’m excited to just be together. Without anything else. Just us. Eachother. We’ve felt married in most regards for some time now but I anticipate a different feeling will come after we say I do’s. In fact, we’re writing our own vows because if they come from the heart, I believe you’ll stick to them more. Like when I say that I’ll promise to always make Tony try any food I make… including TOFU. Hehehe. 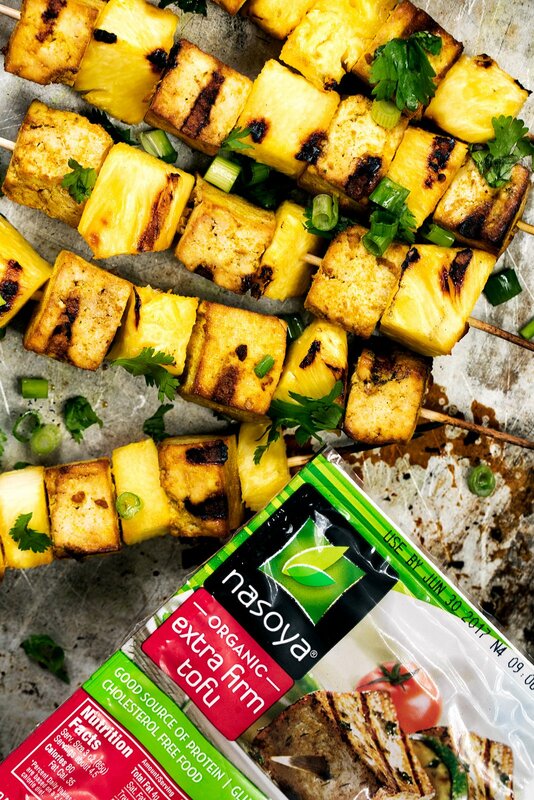 On a lighter and less serious note, I’ve been crushing on tofu like crazy ever since I started partnering with Nasoya tofu. Most of you know that I’m not vegetarian, but I’ve been really loving enjoying meatless meals — from salads to tofu kabobs, Abra’s got me on the vegetarian train and I’m not mad about it. So what do you need to know about tofu? 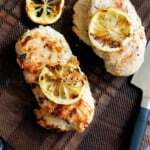 It’s essentially flavorless, which means that marinating it is key to good flavor. Even if it’s just for 20 minutes, a good marinade makes all the difference. Also, it’s best to use super firm tofu so that it doesn’t fall apart on the grill. 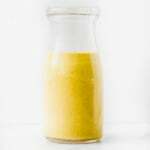 This particular marinade is made with anti-inflammatory turmeric, ginger, garlic, tamari (aka gluten free soy sauce) and fresh pineapple juice (or orange juice!). The kabobs are incredibly easy to make and make a great Meatless Monday dinner or perfect for a vegetarian/vegan if you’re grilling for one. You guys are going to love these. Dress them up with a little cilantro and hot sauce for good measure. xoxo! Beautiful ready to grill tofu kabobs with a soy ginger turmeric marinade and fresh pineapple cubes. Delicious and perfect for the vegetarians in your life! 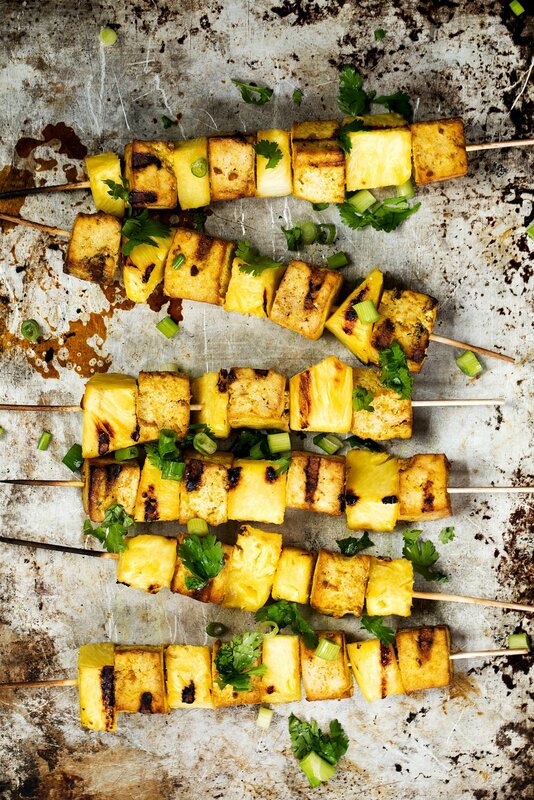 Thread the tofu and pineapple onto skewers, you should get about 8 skewers total. Grill for 10 minutes total, rotating every few minutes. 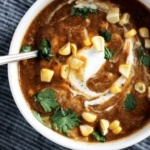 Enjoy with fresh cilantro, green onion and hot sauce, if desired. This post is in partnership with Nasoya Tofu, a brand I trust. Thanks for supporting AK and the brands that help make this site possible! 26 Responses to "Vegan Turmeric Pineapple Tofu Kabobs"
Something about pineapple and turmeric together is magic!!! I just got a shrub with those flavors that you mix with sparkling water and its amazing. I’m sure these kebobs are too!! Awesome recipe. Love everything about it and it looks super simple too. Need to try it asap! Ha ha my husband will try anything I make once. Turmeric is awesome because it doesn’t have a strong flavor but provides tons of anti -inflammatory benefits and a great color! I love using it when I make cauliflower rice! As for tofu – I love super firm tofu that’s been grilled! I love pineapple anytime! It’s fantastic and so good for your tummy. Tofu and pineapple on the barbecue sounds like HEAVEN. 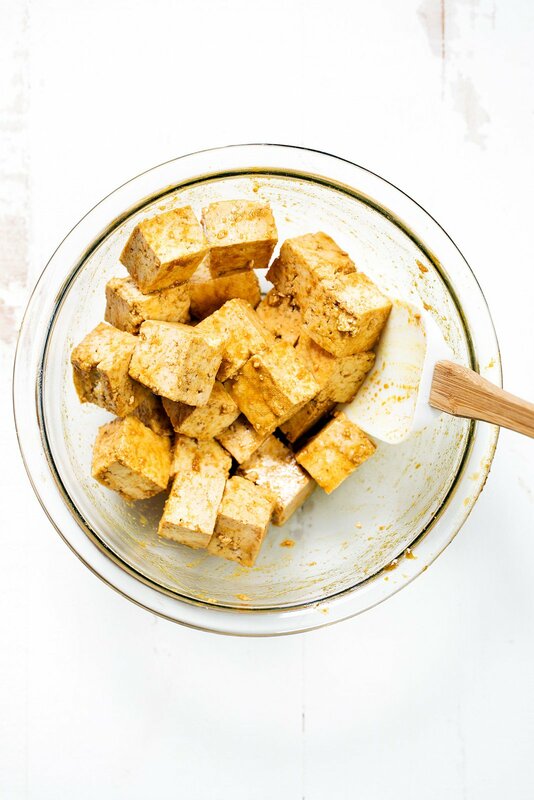 You always share such amazing tofu recipes! I am looking for tofu on the grill and this fits the bill. 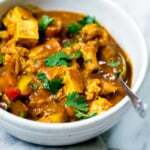 I love pineapple and another way to add turmeric-heard that it helps protect the liver. Perfect! Hope you get a chance to try this one 🙂 It’s delicious! I loved this! The flavors were amazing! I think I made a mistake in marinating it for 24 hours and not flipping the tofu, because the bottom half of the cubes (the side down in the marinate) got super crumbly and were really sticky to the bbq and made a mess… but the end result was delicious! Mama and toddler approved! So glad you and your kiddo loved this one! Hmmm that could’ve been the extra marinade on one side – you might want to oil the grill grates a bit extra next time! 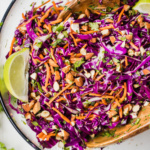 These are a great healthy dinner!